The chairman, Adamawa state chapter of the Christian Association of Nigeria (CAN), Dami Mamza, has faulted the security architecture in the country for the incessant killings in Adamawa State, saying members of the security set-up in the country are complicit in the killings. He said that 43 villages had been pillaged by what he called ‘herdsmen terrorists,’ while no serious action had been taken to prevent or apprehend the perpetrators. Dami made the remark Wednesday, at the venue of the foiled planned protest by the Christian Association of Nigeria (CAN), in Yola, Adamawa State. Dami said the protest organised by CAN was in the defense of human cause and to make a demand on government to halt the mayhem and protect the dignity of human lives. 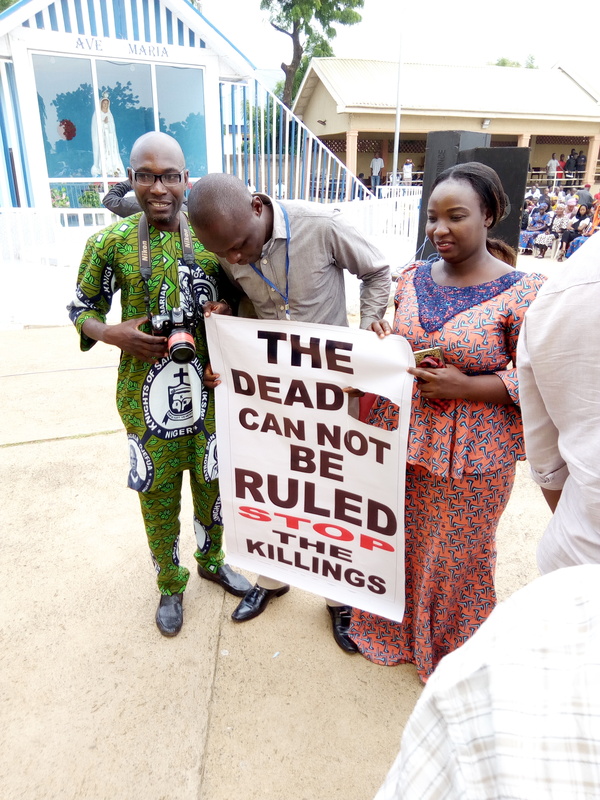 Dami’s words, “While several Christians have been killed on a daily basis, the protest is not about just Christians but on the sanctity of human lives. “God is the one that gives life and no one has the right to take it recklessly. The clergy also slammed the security architecture of the country for the indiscriminate loss of lives saying, “I have been an active participant in reporting the impending attacks to all the security operatives in the state. “Like the recent attack on Kwayine, the community were aware of the incident that the armed men were mobilising to attack three days before the attack. Speaking on the foiled protest, Dami said the police has failed to provide security for the protest which is meant to be an avenue for the Christian community in the state to deliver a letter expressing their displeasure over the unrestrained killings in the state to the president through the Chief security officer of the state, governor Muhammed Jibrilla. Dami who opted to read the letter meant to president, Muhammadu Buhari said, “Mr. President, greetings in the name of our Lord and Saviour, Jesus Christ. “The Christian community in Adamawa state has mandated the state chapter of Christian Association of Nigeria (CAN), to write this letter, which conveys their grievances as a result of the mindless ravaging and/or massacre of Christian farming communities by arms wielding Fulani herdsmen. “CAN is constrained to take this action as the killings have continued with reckless abandon, more so that perpetrators of the killings appear to be above the laws of the land. “As an umbrella body for Christians, CAN is deeply disturbed that these killings are revolving mostly within and around agrarian Christians in their own ancestral lands. “As Mr. President may be well aware, that no week or two passes by without a major raid or two taking place; leaving scores of Christian farmers dead around the state, especially among riverine communities. “In the recent past, precisely four weeks ago, Douwaya village in Demsa Local Government Area was attacked by suspected Fulani herdsmen. “That unprovoked raid left behind over twenty fatality figures, residential buildings, grains destroyed by fire and livestock carted away. “Thereafter, within a space of just two weeks, Bare village in Numan LGA and Kola village in Guyuk LGA were attacked four days a piece, with a death toll of about twenty. “Most recently, Mr. President Sir, five riverine communities in Numan and Demsa LGAs on the borderline between Adamawa and Taraba states fell to the reign of herdsmen’s terror. “As was widely reported in the mass media, no fewer than sixty people were killed and all the villages sacked. This was closely followed by a similar raid on Luru in Girei and Gwamba in Demsa LGAs respectively, with unspecified number of deaths. “What is glaring to us as a community of peaceful and law abiding citizens is that the incessant attacks tinges a suspected ethno-religious cleansing and the president must act fast to prevent it or at best, neo-colonization. “Further still, CAN is worried by the seeming conspiracy of silence, especially among critical security stakeholders, namely the Adamawa State government, Federal government and security operatives on these killings. “We have it on good authority that often government officials detest when journalists broadcast news of herdsmen killings. For instance, barely one week ago, Kwayine, and three other riverine villages along the banks of River Benue, were sacked and it took almost four days before government’s attention was purportedly drawn to their plight. “Mr. President, as a religious body, we must confront issues with the truth no matter whose ox is gored. “Therefore, be informed in all honesty, that Nigeria under your leadership is more divided than at any time in our history. “And this is because Nigerians, right or wrong, have perceived the security architecture of the country as colluding with armed Fulani militia and the President seems indecisive. “While Adamawa State CAN does not share in the view that the President of the Federal Republic of Nigeria is supporting the killings, we however hold strong reservations about the President’s docile posture while killings rage. “Just as the President’s body-language may sway us to lean towards the theory which suggests that security operatives are not decisive on the herdsmen menace because they are Mr. President’s kith and kin. “Mr. President, we demand justice; we demand an end to killings in our state and the country at large. The foiled protest however took a new dimension when angry youths took to the streets in defiance of police orders as they insist on the right to protest against the killings in the state. One of the protesters said, “We will go on with the protest, we don’t care whether the police want it, everyone one of us here has lost someone, if your father was not killed your brother or sister or relatives, friends must have been brutally murdered. A Legal practitioner and human right activist Nari Welye said, “This is exactly what Nigerians should have been doing on a daily basis until government begins to do what is right. Some of the angry protesters were later dispersed by police as tear gas was shot at the protesters. Stop protesting. He is adamant to protests. He will not listen. Just do one thing. Pray that the living God nigerian Christians serve will keep you alive till 2019 . Use your vote and vote him out.